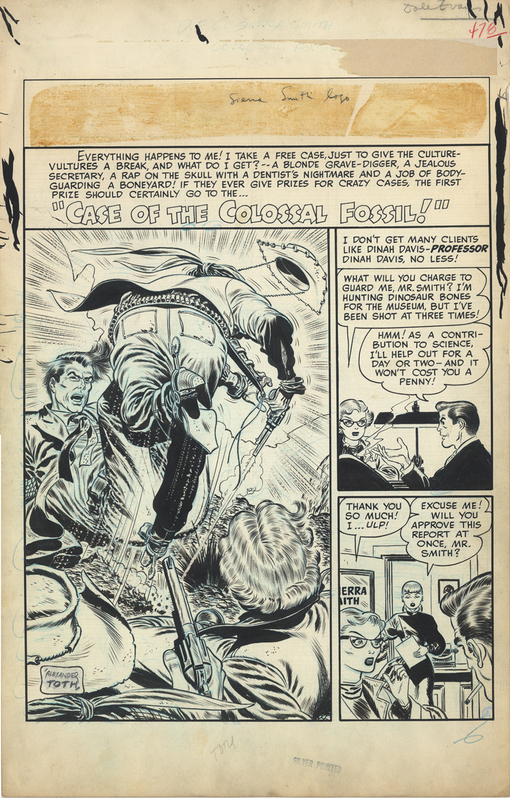 This page is a Sierra Smith splash, first appearing in DC Comics Dale Evans #6. 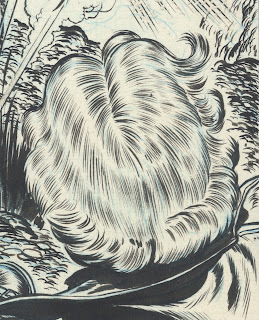 It is penciled by Alex Toth, probably inked by Sy Barry, brother of Dan Barry, artist on Flash Gordon in the 50's and 60's among other things. Toth obviously, in this late 40's period, hadn't started honing in on the famed simplicity of his mature style. It's a cool page nonetheless. I am struck by the beautiful intricacy of the drapery folds and the detailing on the boots and spurs of the man being kicked in the stomach. 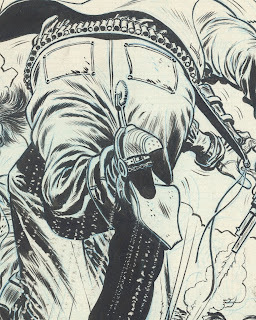 Equally inspiring is the ammo belt, how as the bullet holder holes are drawn in perspective, some empty, some full, culminating in a side view upshot on the holster with the knotted string dangling therefrom. I also want to point out the beauty of the foreground rear close-up of the woman's coiffeure, contrasted with two much simpler views of the same hairdo seen from the front.